Our staff at Medifocus is committed to keeping our subscribers to the Medifocus Digest Alert on Trigeminal Neuralgia abreast of the latest new research developments that have recently been published in the medical literature for this condition. In this issue of the Digest Alert, you will find a focused list of hand-picked journal article references that represent the latest advances in basic and clinical research for Trigeminal Neuralgia. These articles represent the current state-of-the-art of the research that will hopefully lead to additional major advances and breakthroughs in the clinical management of Trigeminal Neuralgia. You can access the summaries of each article referenced below by simply clicking on the article Title. We will continue to update you with the latest scientific and clinical developments through the Medifocus Digest Alert on Trigeminal Neuralgia every 3 months. Thank you for your ongoing subscription to this publication. 1: Acupuncture treatment on idiopathic trigeminal neuralgia: A systematic review protocol. Institution: Department of Acupuncture and Moxibustion, Tongde Hospital of Zhejiang Province. China. China. China. Journal: Medicine (Baltimore). 2019 Jan;98(4):e14239. doi: 10.1097/MD.0000000000014239. 2: Study on the Therapeutic Effects of Trigeminal Neuralgia With Microvascular Decompression and Stereotactic Gamma Knife Surgery in the Elderly. Institution: Department of Neurosurgery, The Second Hospital of Shandong University, Jinan, China. Journal: J Craniofac Surg. 2019 Jan;30(1):e77-e80. doi: 10.1097/SCS.0000000000004999. 3: Surgical treatment of trigeminal neuralgia with no neurovascular compression: A retrospective study and literature review. Institution: Department of Skull Base Surgery Center, Department of Neurosurgery, XuanWu Hospital, Capital Medical University, Beijing, China. Electronic address: guohongchuan2016@163.com. Journal: J Clin Neurosci. 2018 Dec;58:42-48. doi: 10.1016/j.jocn.2018.10.066. Epub 2018 Oct 24. 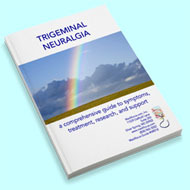 4: Surgical Management of Trigeminal Neuralgia in Children. Institution: School of Medicine, Marian University College of Osteopathic Medicine, Indianapolis, Indiana, USA. ; Section of Pediatric Neurosurgery, Riley Hospital for Children, Department of Neurological Surgery, Goodman Campbell Brain and Spine, Indiana University School of Medicine, Indianapolis, Indiana, USA. Electronic address: jraskin@goodmancampbell.com. Journal: World Neurosurg. 2019 Jan;121:217-221. doi: 10.1016/j.wneu.2018.10.074. Epub 2018 Oct 19. 5: Trigeminal neuralgia associated with ophthalmic surgery: a case series. Institution: Ophthalmology Department, Sanatorio Mapaci. Grupo Laser Vision, Mariano Moreno 1397, CP 2000, Rosario, Santa Fe, Argentina. pilarlucena@gmail.com. 1397, CP 2000, Rosario, Santa Fe, Argentina. "Dr. Carlos Ferroni", Rosario, Santa Fe, Argentina. 1397, CP 2000, Rosario, Santa Fe, Argentina. fannygerster@gmail.com. Journal: J Med Case Rep. 2018 Sep 8;12(1):256. doi: 10.1186/s13256-018-1795-8. 6: LINAC stereotactic radiosurgery for trigeminal neuralgia -retrospective two-institutional examination of treatment outcomes. Institution: Department of Radiosurgery and Stereotactic Radiotherapy, MediClin Robert Janker Clinic and MediClin MVZ Bonn, Villenstrasse 8, 53129, Bonn, Germany. Burkle-de-la-Camp-Platz 1, 44789, Bochum, Germany. Bonn, Sigmund-Freud-Strasse 25, 53105, Bonn, Germany. Germany. Germany. Clinic and MediClin MVZ Bonn, Villenstrasse 8, 53129, Bonn, Germany. Jan.Bostroem@mediclin.de. 25, 53105, Bonn, Germany. Jan.Bostroem@mediclin.de. Journal: Radiat Oncol. 2018 Aug 22;13(1):153. doi: 10.1186/s13014-018-1102-2. 7: Re-Exploration of Microvascular Decompression in Recurrent Trigeminal Neuralgia and Intraoperative Management Options. Institution: The Walton Centre, Liverpool, United Kingdom. Electronic address: madh@doctors.org.uk. Journal: World Neurosurg. 2018 Sep;117:e67-e74. doi: 10.1016/j.wneu.2018.05.147. Epub 2018 May 29. 8: First treatment and retreatment of medically refractive trigeminal neuralgia by stereotactic radiosurgery versus microvascular decompression: a systematic review and Meta-analysis. Institution: a Sydney Medical School, The University of Sydney , Sydney , NSW , Australia. Prince Alfred Hospital, The University of Sydney , Sydney , NSW , Australia. Journal: Br J Neurosurg. 2018 Aug;32(4):355-364. doi: 10.1080/02688697.2018.1472213. Epub 2018 May 10. 9: Percutaneous balloon compression for persistent or recurrent trigeminal neuralgia after microvascular decompression: personal experience of 28 patients. Institution: Department of Neurosurgery, Nanjing Drum Tower Hospital Clinical College of Nanjing Medical University, 321 Zhongshan Road, Nanjing, 210008, Jiangsu, China. neurosurgery12c@163.com. Journal: Acta Neurol Belg. 2018 Dec;118(4):561-566. doi: 10.1007/s13760-017-0858-8. Epub 2017 Nov 6.